This article is about the city in Syria. For other uses, see Hama (disambiguation). Hama (Arabic: حماة‎‎ Ḥamāh [ħaˈmaː]; Biblical Hebrew: חֲמָת‎ Ḥamāth, "fortress") is a city on the banks of the Orontes River in west-central Syria. 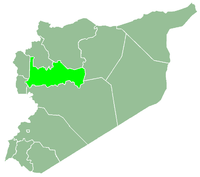 It is located 213 km (132 mi) north of Damascus and 46 kilometres (29 mi) north of Homs. It is the provincial capital of the Hama Governorate. 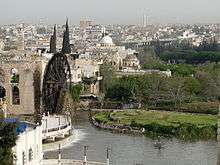 With a population of 854,000 (2009 census), Hama is the fourth-largest city in Syria after Aleppo, Damascus and Homs. In the last decades, the city of Hama has become known as a center of the anti-Ba'ath opposition in Syria, most notably the Muslim Brotherhood. The city was raided by the Syrian Army, beginning with the 1964 Hama riot, and becoming the scene of carnage during the Islamist uprising in Syria with the 1981 Hama massacre and a year later, when nearly 25,000 people were killed in what became known as the 1982 Hama massacre. The city was once again the site of conflict between the Syrian military and opposition forces as one of the main arenas of the Syrian civil war during the 2011 siege of Hama. The ancient settlement of Hamath was occupied from the early Neolithic to the Iron Age. Remains from the Chalcolithic have been uncovered by Danish archaeologists on the mount on which the former citadel once stood. The excavation took place between 1931 and 1938 under the direction of Harald Ingholt. The stratigraphy is very generalized, which makes detailed comparison to other sites difficult. Level M (6 m or 20 ft thick) contained both white ware (lime-plaster) and true pottery. It may be contemporary with Ras Shamra V (6000–5000 BC). The overlying level L dates to the Chalcolithic Halaf culture. Although the town appears to be unmentioned in cuneiform sources before the first millennium BC, the site appears to have been prosperous around 1500 BC, when it was presumably an Amorite dependency of Mitanni, an empire along the Euphrates in northeastern Syria. Mitanni was subsequently overthrown by the Hittites, who controlled all of northern Syria following the famous Battle of Kadesh against Ancient Egypt under Ramesses II near Homs in 1285. In early 19th century, Johann Ludwig Burckhardt was the first to discover Hittite or Luwian hieroglyphic script at Hama. The site also shows Assyrian and Aramaean settlement. By the turn of the millennium, the centralized old Hittite Empire had fallen, and Hama is attested as the capital of one of the prosperous Syro-Hittite states known from the Hebrew Bible as Hamath (Aramaic: Ḥmt; Hittite: Amatuwana; Hebrew: חֲמָת‎‎‎ Ḥəmåṯ), which traded extensively, particularly with Israel and Judah. When the Assyrian king Shalmaneser III (BC 858-824) conquered the north of Syria he reached Hamath (Assyrian: Amat or Hamata) in 835 BC; this marks the beginning of Assyrian inscriptions relating to the kingdom. Irhuleni of Hamath and Hadadezer of Aram-Damascus (biblical "Bar-Hadad") led a coalition of Syrian cities against the encroaching Assyrian armies. According to Assyrian sources, they were confronted by 4000 chariots, 2000 horsemen, 62,000-foot-soldiers and 1,000 Arab camel-riders in the Battle of Qarqar. The Assyrian victory seems to have been more of a draw, although Shalmaneser III continued on to the shore and even took a ship to open sea. In the following years, Shalmaneser III failed to conquer Hamath or Aram-Damascus. After the death of Shalmaneser III, the former allies Hamath and Aram-Damascus fell out, and Aram-Damascus seems to have taken over some of Hamath's territory. An Aramaic inscription of Zakkur, dual king of Hamath and Luhuti, tells of an attack by a coalition including Sam'al under Ben-Hadad III, son of Hazael, king of Aram-Damascus. Zakir was besieged in his fortress of Hazrak, but saved by intervention of the God Baalshamin. Later on, the state of Sam'al came to rule both Hamath and Aram. In 743 BC, Tiglath-Pileser III took a number of towns in the territory of Hamath, distributed the territories among his generals, and forcibly removed 1223 selected inhabitants to the valley of the Upper Tigris; he exacted tribute from Hamath's king, Eni-Ilu (Eniel). In 738 BC, Hamath is listed among the cities again conquered by Assyrian troops. Over 30,000 natives were deported to Ullaba and replaced with captives from the Zagros Mountains. After the fall of the northern kingdom of Israel, Hamath's king Ilu-Bi'di (Jau-Bi'di) led a failed revolt of the newly organized Assyrian provinces of Arpad, Simirra, Damascus, and Samara. Styling himself the "Destroyer of Hamath," Sargon II razed the city ca 720 BCE, recolonized it with 6,300 Assyrians, and removed its king to be flayed alive in Assyria. He also carried off to Nimrud the ivory-adorned furnishings of its kings. The few Biblical reports state that Hamath was the capital of a Canaanite kingdom (Genesis 10:18; 2 Kings 23:33; 25:21), whose king congratulated King David on his victory over Hadadezer, king of Zobah (2 Samuel 8:9-11; 1 Chronicles 18:9-11). In God’s instructions to Moses, Hamath is specified as part of the northern border of the land that will fall to the children of Israel as an inheritance when they enter the land of Canaan. Solomon, it would seem, took possession of Hamath and its territory and built store cities. Assyria's defeat of Hamath made a profound impression on Isaiah. The prophet Amos called the town "Hamath the Great." Indeed, the name appears to stem from Phoenician khamat, "fort." In the second half of the 4th century BC the modern region of Syria came under the influence of Greco-Roman culture, following long lasting semitic and Persian cultures. Alexander the Great's campaign from 334 to 323 BC brought Syria under Hellenic rule. Since the country lay on the trade routes from Asia to Greece, Hama, and many other Syrian cities, again grew rich through trade. After the death of Alexander the Great his Near East conquests were divided between his generals, and Seleucus Nicator became ruler of Syria and the founder of the Seleucid dynasty. Under the Seleucids there was a revival in the fortunes of Hama. The Aramaeans were allowed to return to the city, which was renamed Epiphania (in Greek: Επιφανεία), after the Seleucid Emperor Antiochus IV Epiphanes. Seleucid rule began to decline, however, in the next two centuries, and Arab dynasties began to gain control of cities in this part of Syria, including Hama. The Romans took over original settlements such as Hama and made them their own. They met little resistance when they invaded Syria under Pompey and annexed it in 64 BC, whereupon Hama became part of the Roman province of Syria, ruled from Rome by a proconsul. Hama was an important city during the Greek and Roman periods, but very little archaeological evidence remains. In AD 330, the capital of the Roman Empire was moved to Byzantium, and the city continued to prosper. In Byzantine days Hama was known as Emath or Emathoùs (Εμαθούς in Greek). Roman rule from Byzantium meant the Christian religion was strengthened throughout the Near East, and churches were built in Hama and other cities. The Byzantine historian John of Epiphania was born in Hama in the 6th century. During the Muslim conquest of Syria in the 7th century, Hama was conquered by Abu Ubaidah ibn al-Jarrah in 638 or 639 and the town regained its ancient name, and has since retained it. Following its capture, it came under the administration of Jund Hims and remained so throughout the rule of Umayyads until the 9th century. Arab geographer al-Muqaddasi writes Hama became a part of Jund Qinnasrin during Abbasid rule. Although the city's history is obscure at this time period, it is known that Hama was a walled market town with a ring of outlying cities. 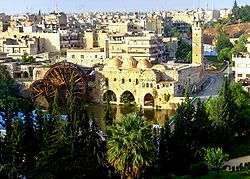 It came under the control of the Hamdanid rulers of Aleppo in the 10th century and was consequently drawn into the orbit of that city where it remained until the 12th century. These were considered the "dark years" of Hama as the local rulers of northern and southern Syria struggled for dominance in the region. The Byzantines under emperor Nicephorus Phocas raided the town in 968 and burned the Great Mosque. By the 11th century, the Fatimids gained suzerainty over northern Syria and during this period, the Mirdasids sacked Hama. Persian geographer Nasir Khusraw noted in 1047 that Hama was "well populated" and stood on the banks of the Orontes River. Tancred, Prince of Galilee, took it in 1108, but in 1114 the Crusaders lost it definitively to the Seljuks. In 1157 an earthquake shattered the city. For the next sixty years, Hama was battled for by competing rulers. 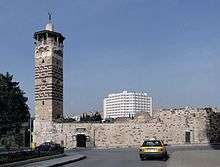 Nur al-Din, the Zengid sultan, erected a mosque with a tall, square minaret in the city in 1172. In 1175, Hama was taken from the Zengids by Saladin. He granted the city to his nephew, al-Muzaffar Umar, four years later, putting it under the rule of his Ayyubid family. This ushered in an era of stability and prosperity in Hama as the Ayyubids ruled it almost continuously until 1342. 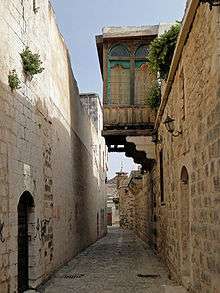 Geographer Yaqut al-Hamawi, who was born in Hama, described it in 1225 as a large town surrounded by a strongly built wall. Hama was sacked by the Mongols in 1260, as were most other Syrian cities, but the Mongols were defeated that same year and then again in 1303 by the Mamluks who succeeded the Ayyubids as rulers of the region. Hama briefly passed to Mamluk control in 1299 after the death of governor al-Mansur Mahmoud II. However, unlike other former Ayyubid cities, the Mamluks reinstated Ayyubid rule in Hama by making Abu al-Fida, the historian and geographer, governor of the city and he reigned from 1310 to 1332. He described his city as "very ancient... mentioned in the book of the Israelites. It is one of the pleasantest places in Syria." After his death, he was succeeded by his son al-Afdal Muhammad who eventually lost Mamluk favor and was deposed. Thus, Hama came under direct Mamluk control. Hama grew prosperous during the Ayyubid period, as well as the Mamluk period. It gradually expanded to both banks of the Orontes River, with the suburb on the right bank being connected to the town proper by a newly built bridge. The town on the left bank was divided into upper and lower parts, each of which was surrounded by a wall. The city was filled with palaces, markets, mosques, madrasas, and a hospital, and over thirty different sized norias (water-wheels). In addition, there stood a massive citadel in Hama. Moreover, a special aqueduct brought drinking water to Hama from the neighboring town of Salamiyah. Ibn Battuta visited Hama in 1335 and remarked that the Orontes River made the city "pleasant to live in, with its many gardens full of trees and fruits." He also speaks of a large suburb called al-Mansuriyyah (named after an Ayyubid emir) that contained "a fine market, a mosque, and bathes." In 1400, Timurlane conquered Hama, along with nearby Homs and Baalbek. The prosperous period of Mamluk rule came to an end in 1516, when the Ottoman Turks conquered Syria from the Mamluks after defeating them at the Battle of Marj Dabiq near Aleppo. Hama, and the rest of Syria, came under Ottoman rule from Constantinople. Under the Ottomans, Hama gradually became more important in the administrative structure of the region. It was first made capital of one of the liwas ("districts") of the vilayet ("province") of Tripoli. Hama once again became an important center for trade routes running east from the Mediterranean coast into Asia. A number of khans ("caravansaries"s) were built in the city, like Khan Rustum Pasha which dates from 1556. Syria was later divided into three governorships and Hama was ruled by the governorship based at Aleppo. Then in the 18th century, it became a part of the holdings of the governor of Damascus. The governors of Damascus at this time were the Azems, who also ruled other parts of Syria, for the Ottomans. They erected sumptuous residences in Hama, including the Azem Palace and Khan As'ad Pasha which were built by As'ad Pasha al-Azem, who governed Hama for a number of years until 1742. By then, there were 14 caravansaries in the city, mostly used for the storage and distribution of seeds, cotton, wool, and other commodities. 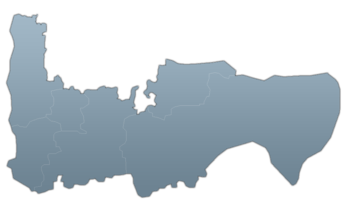 After the passing of the Vilayet Law in 1864, Hama became the capital of the Sanjak of Hama (gaining the city more administrative powers), part of the larger vilayet of Sham. Ottoman rule ended in 1918, after their defeat in World War I to the Allied Forces. Hama was made part of the French Mandate of Syria. By then, Hama had developed into what it has remained: a medium-sized provincial town, important as the market for an agricultural area abundant in cereals, but also cotton and sugar beets. It gained notoriety as the center of large estates worked by peasants and dominated by a few magnate families. During the French Mandate, the district of Hama contained within its bounds the municipality of Hama and 114 villages. By an estimate in 1930, only four of these villages were owned outright by local cultivators, while sharing ownership of two villages with a notable family. Thus, the hinterland was owned by landowning elites. Starting in the late 1940s, significant class conflict erupted as agricultural workers sought reform in Hama. 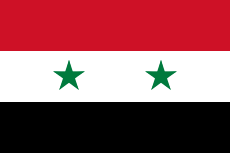 Syria gained full independence from France in 1946. Akram al-Hawrani, a member of an impoverished notable family in Hama, began to agitate for land reform and better social conditions. He made Hama the base of his Arab Socialist Party, which later merged with another socialist party, the Ba'ath. This party's ascent to power in 1963 signaled the end of power for the landowning elite. 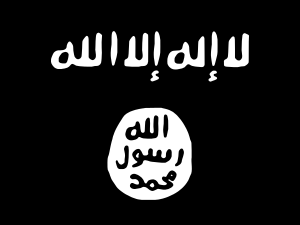 Political insurgency by Sunni Islamic groups, particularly the Muslim Brotherhood, occurred in the city, which was reputed as a stronghold of conservative Sunni Islam. 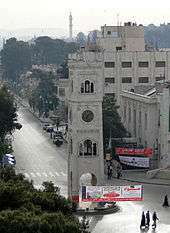 As early as the spring of 1964, Hama became the epicenter of an uprising by conservative forces, encouraged by speeches from mosque preachers, denouncing the policies of the Ba'ath. The Syrian government sent tanks and troops into the quarters of Hama's old city to put down the insurrection. In the early 1980s, Hama had emerged as a major source of opposition to the Ba'ath government during the Sunni armed Islamist uprising, which had begun in 1976. The city was a focal point for bloody events in the 1981 massacre and the most notable 1982 Hama massacre. The most serious insurrection of the Syrian Islamic uprising happened in Hama during February 1982, when Government forces, led by the president's brother, Rifaat al-Assad, quelled the revolt in Hama with very harsh means. Tanks and artillery shelled the neighbourhoods held by the insurgents indiscriminately, and government forces are alleged to have executed thousands of prisoners and civilian residents after subduing the revolt, which became known as the Hama massacre. The story is suppressed and regarded as highly sensitive in Syria. Its climate is classified as hot semi-arid (BSh) in Köppen-Geiger system. Hama's inland location ensures that it receives no softening costal influences and breezes from the Mediterranean Sea. As a result, the city has a much hotter and dryer climate than nearby Homs. According to Josiah C. Russel, during the 12th century, Hama had a population of 6,750. James Reilly accounts the historical population as: 1812- 30,000 (Burckhardt) 1830- 20,000 (Robinson) 1839- 30–44,000 (Bowring) 1850- 30,000 (Porter) 1862- 10–12,000 (Guys) 1880- 27,656 (Parliamentary Papers) 1901- 60,000 (Parliamentary Papers) 1902-1907 80,000 (Trade Reports) 1906- 40,000 (al-Sabuni) 1909- 60,000 (Trade Reports) In 1932, while Hama was under the French Mandate, there were approximately 50,000 residents. In the 1960 census, there were 110,000 inhabitants. The population continued to rise, reaching 180,000 in 1978 and 273,000 in 1994. The infant mortality rate per 1,000 live births in the Hama Governorate was 99.4. A 2005 estimate had Hama's population at around 325,000 inhabitants. Most of the residents are Sunni Muslims, although some districts of the city are exclusively Christian. Hama is reputed to be the most conservative Sunni Muslim city in Syria since French Mandate times. During that period there was an old saying reflecting this characteristic: "In Damascus, it takes only three men to make a political demonstration, while in Hama it takes only three men to get the town to pray." The Christian population mostly adheres to the Greek Orthodox Church or the Syriac Orthodox Church. 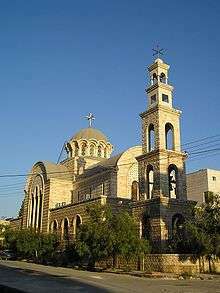 The Greek Orthodox Church has a prelacy in Hama under the Patriarch of Antioch. Hama is still a Roman Catholic titular see (referred to as "Hamath" or Amath"), suffragan of Apamea. It is as "Epiphania" that it is best known in ecclesiastical documents. Lequien mentions nine Greek bishops of Epiphania. The first of them, whom he calls Mauritius, is the Manikeios whose signature appears in the First Council of Nicaea. Currently, it has two Catholic archbishops, a Greek Melkite and a Syrian, the former residing at Labroud, the latter at Homs, reuniting the titles of Homs (Emesus) and Hamah. 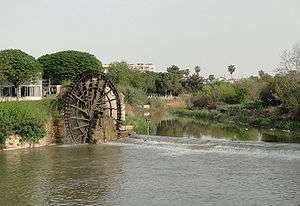 Hama's most famous attractions are the 17 Norias of Hama (Arabic: نواعير حماة‎‎), dating back to the Byzantine times. Fed by the Orontes river, they are up to 20 metres (66 ft) in diameter. The largest norias are the al-Mamunye (1453) and the al-Muhammediye (14th century). Originally they were used to route water into aqueducts, which led into the town and the neighbouring agricultural areas. al-Nuri mosque, finished in 1163 by Nur ad-Din after the earthquake of 1157. Notable is the minaret. The mosque and Mausoleum of Abu al-Fida, a celebrated Arab historian who was also governor of the city. al-Hasanain mosque, also rebuilt by Nur ad-Din after the aforementioned earthquake. The Great Mosque. Destroyed in the 1982 bombardment, it has been rebuilt in its original forms. It has elements dating from the ancient and Christian structures existing in the same location. It has two minarets, and is preceded by a portico with an elevated treasury. ↑ "2004 official census" (PDF). cbss. Retrieved 2013-11-04. ↑ "Hamah (Syria)". Encyclopedia Britannica. Retrieved 3 June 2013. 1 2 3 Ring, 1996, p.315. 1 2 3 4 5 6 Hawkins, J.D. "Hamath." Reallexikon der Assyriologie und Vorderasiatischen Archäologie, Vol. 4. Walter de Gruyter, 1975. ↑ "Hamath". Jewish Encyclopedia. Jewishencyclopedia.com. Retrieved 2013-02-04. ↑ Hamath's history from the inscriptions was encapsulated by George L. Robinson, "The Entrance of Hamath" The Biblical World 32.1 (July 1908:7–18), in discussing the topography evoked by the Biblical phrase "the entrance of Hamath". ↑ 1 Kings 4:21–24; 2 Chronicles 8:4. ↑ Room, Adrian. Placenames of the World. London: MacFarland and Company, Inc., 1997. 1 2 3 4 Ring, 1996, p.317. 1 2 3 4 5 6 7 8 9 10 11 Dumper, Stanley, and Abu-Lughod, 2007, p.163. ↑ le Strange, 1890, p.39. ↑ le Strange, 1890, p.357. ↑ Nur al-Din Mosque. Archnet Digital Library. ↑ le Strange, 1890, p.359. 1 2 le Strange, 1890, p.360. ↑ le Strange, 1890, p.xxiii. 1 2 3 Ring, 1996, p.318. 1 2 3 Dumper, Stanley, and Abu-Lughod, 2007, p. 164. ↑ Larbi Sadiki. "In Syria, the government is the real rebel – Opinion". Al Jazeera English. Retrieved 2011-07-31. ↑ "English.alarabiya.net". English.alarabiya.net. 9 July 2011. Retrieved 2011-07-31. 1 2 "Hama, Syrian Arab Republic: Climate, Global Warming, and Daylight Charts and Data". Climate Charts. Retrieved 1 August 2013. ↑ M. Kottek; J. Grieser; C. Beck; B. Rudolf; F. Rubel (2006). "World Map of the Köppen-Geiger climate classification updated". Meteorol. Z. 15: 259–263. doi:10.1127/0941-2948/2006/0130. Retrieved 1 August 2013. 1 2 Dumper, Stanley, and Abu-Lughod, 2007, p.162. 1 2 Schaff and Herzog, 1911, p.232. ↑ Oriens Christianus, II, pp.915–918. ↑ Gelzer, Heinrich, Patrum Nicaenorum Nomina. p.lxi. Dumper, Michael; Stanley, Bruce E.; Abu-Lughod, Janet L. (2007), Cities of the Middle East and North Africa: A Historical Encyclopedia, ABC-CLIO, ISBN 9781576079195 . Herzog, Johann Jakob; Schaff, Phillip (1911), The new Schaff-Herzog encyclopedia of religious knowledge: embracing Biblical, historical, doctrinal, and practical theology and Biblical, theological, and ecclesiastical biography from the earliest times to the present day, Funk and Wagnalls Company . Ring, Trudy; Berney, K.A. ; Salkin, Robert M.; La Boda, Sharon; Watson, Noelle; Schellinger, Paul (1996), International Dictionary of Historic Places: Middle East and Africa, Routledge, ISBN 1-884964-03-6 . Shatzmiller, Maya (1994), Labour in the medieval Islamic world, BRILL, ISBN 9789004098961 .
le Strange, Guy (1890), Palestine Under the Moslems: A Description of Syria and the Holy Land from A.D. 650 to 1500, Committee of the Palestine Exploration Fund . Winckler, Onn (1998), Demographic developments and population policies in Baʻathist Syria, Sussex Academic Press, ISBN 1-902210-16-6 . Wikimedia Commons has media related to Hama. Wikivoyage has a travel guide for Hama.